See the insides of the Casio QV-3000. 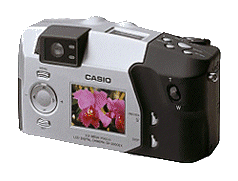 Casio Photo Library Viewer - Not being satisfied with the bundled image library viewer, I wrote my own software to do it. 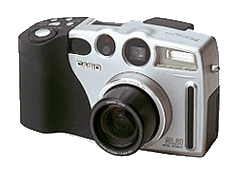 QVRemote - Allows you to use your EPOC handheld computer to control Casio QV-series digital cameras. There is also a SIBO version for older Psion handhelds. PhotoBeamer - Allows you to send photos to your EPOC handheld computer via IR using the IrTran-P protocol. IrPhotoClip - For EPOC handheld computers. Receives, via infra-red (IrTran-P), photos from your compatible digital camera and pastes them onto the clipboard, ready for pasting into your Word, Agenda/Calendar, and Data documents. Perl EXIF Utility - A Perl script to read EXIF fields in JPEG files created by digital cameras. Why I decided on the Casio QV-3000. My comparison between fine quality JPEG and TIFF photos on the Casio QV-3000. My research into resolution, along with some simple formulas to guide the selection of different resolutions for different circumstances. FotoAlbum - I'm currently using this free software to scan and organise my old film photos. It seems to be doing a good job so far. I have yet to try the online web-based album service. PixAround - Panorama maker that stitches individual photos together and creates a single large panorama picture that can be viewed by a supplied Java applet or packaged into a stand-alone executable. While the viewer is still free, the creation program is not. The Panorama Factory - The latest versions are shareware, but an earlier version is still available as freeware. Autostitch - Fully automatic panorama stitcher. Fully automatic makes it simple, but there's no manual override for when it gets it wrong. Blending is superb. Support multiple rows of photos. ArcSoft have several software packages available for free download. I've tried out the PhotoPrinter package - it worked, but uses a lot of memory and fails for some really big prints. Beau Software - Photo loader and librarian. Reudo Corporation - IrTran-P software for PC and Macintosh computers. Guido's Tech' Corner has a downloadable program called Jpegtran. This software will perform lossless JPEG rotations, while preserving and updating the EXIF photo information. I've combined it with two batch files in my "Send To" folder on Windows called Rotate Clockwise.bat and Rotate Anticlockwise.bat (the contents of the batch files being: @jpegtran -rotate [90|270] -copy all %1 %1). AVI Editor - can be used to rotate your movies among many other things. ExifView - Add an "EXIF Tags" tab to the Windows Explorer Properties dialog for JPEG files. Exifer for Windows - Lets you edit JPEG comments, EXIF data, and IPTC data. Opanda PowerExif - Very nice looking Window GUI editor. Can edit all fields. EXIF Image Viewer and EXIF InfoTip - EXIF Image Viewer shows image thumbnails and EXIF information. EXIF InfoTip displays EXIF information in a tool tip when you mouse over image files in Windows Explorer. Photo Comment - Just lets you edit the EXIF comment field, but lets you do it by right-clicking on the file in Windows Explorer! MaPiVi - A package written in Perl (doesn't look very easy to setup under Windows) that can read and store thumbnails, EXIF and IPTC information in a database. That database can be searched without needing the original files. Amok EXIF Sorter - Rule-based sorting and renaming of photos. ExifFarm - Windows Explorer integrated EXIF field editor. Someone measured the power consumption of the camera while powered via the external DC input. The table below shows the power consumption for various tasks. All figures are in mA. Play Mode was a constant 380mA. Last updated: 2008-08-25. Copyright © 1999-2019.